KIEV, Ukraine -- Ukrainians vote in a regional election on Sunday that will test the democratic credentials of their president, Viktor Yanukovich. 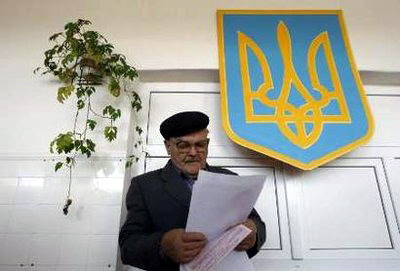 A man reads voting papers during local elections at a polling station in the village Muzychi, about 30 km (19 miles) south-west of Kiev, October 31, 2010. Even before the first ballots were cast today, the election is being dubbed as a setback. “It’s looking like a step backwards,” said Oleksandr Chernenko, head of the Committee of Voters of Ukraine, an election watchdog. The election of mayors and lawmakers to provincial and municipal legislatures is the first election being held under Mr Yanukovich. In the months leading up the vote, criticism has mounted against Mr Yanukovich, who took over as president in February. He is seen as rolling back on democratic gains that followed the 2004 Orange Revolution. Back then a presidential vote rigged in his favour was overturned. Mr Yanukovich has pledged to uphold democracy and improve relations with Russia while keeping Kiev on a path towards European Union integration. But he is accused of monopolising power by trampling on Ukraine’s constitution, repressing oppositionists, cracking down on democracy and press freedoms. Mr Yanukovich denies such accusations, and boasts of establishing the “stability” that is needed to fix Ukraine’s ailing economy. Critics say he is attempting to copy Vladimir Putin’s success in establishing “managed democracy”. A handful of violations were reported in the early hours of Sunday’s vote, but results for the more than 15,000 separate contests under way are not expected for several days. Few election watchdogs expect the massive vote rigging that occurred in 2004. But opposition politicians and pro-democracy activists insist that the pre-election process has already been unfair, tilting the final result in favour of Mr Yanukovich’s allies. Mr Yanukovich brushes aside such allegations, saying the only threat to a fair vote is “provocations”. But fears that election fraud will be prevalent are shared by 58 per cent of citizens, according to an October survey released by Kiev’s Razumkov think-tank. With concerns mounting, the US and European Union have urged Mr Yanukovich to ensure a fair vote and free press. But criticism from both sides of the Atlantic remains soft, fearing that a harder stance could push Mr Yanukovich closer towards Moscow. Oppositionists could stage protests and are desperate for the international community to condemn the vote. “The threat of authoritarianism to Ukraine is real and it is against this backdrop that policymakers across Europe and in the US should scrutinise the fairness of the October 31 elections,” said Yulia Tymoshenko, a leading opposition figure.